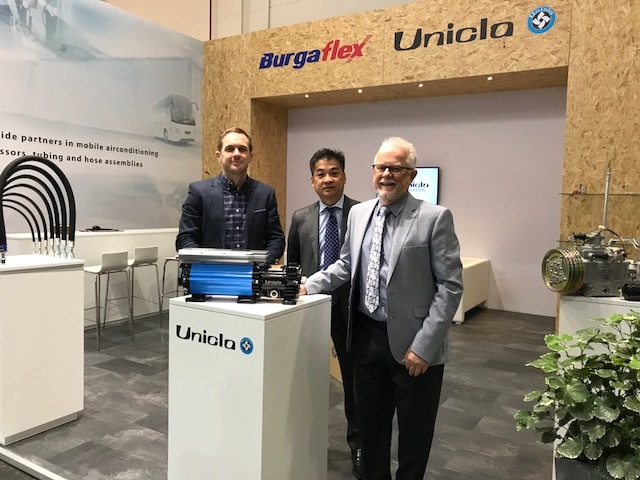 VASA director Mitchell travelled to the IAA Commercial Vehicle show in Hannover, Germany this month to launch the revolutionary eDrive range of compressors developed by his company Unicla International. The Unicla eDrive range features unique onboard control electronics and firmware that actively optimise its operation for different systems and refrigerants, while providing safeguards against unfavourable conditions or refrigerant circuit problems and enabling customisable settings. With CAN bus and LIN connectivity, real-time monitoring of the eDrive compressor’s parameters and operation is possible on-vehicle, or with the optional modem module, it can be remotely monitored via the Unicla eDrive web interface or other proprietary web portals. These connectivity options can be used for diagnostics or even predictive prognosis of emerging problems.